Dragons, Noughts & Crosses and Labyrinth are all based upon the popular Blowing Lotto Game (see link). The players take turns blowing the ball from hole to hole in the plastic tray while trying to control the direction and speed of the ball. The nine holes in the plastic tray contain the same pictures as the game board. Depending on which groove the ball ends up in, the player may cover the corresponding game board field with a chip of his/her colour. 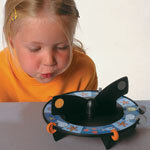 Blowing games develop the command of breathing and mouth muscles and are an excellent speech therapy resource that children will love to play. 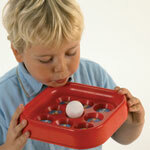 A unique, highly amusing game developing breathing control and lip muscles. The players take turns at blowing the ball from one hole to another. This requires control of the direction and speed of the ball. 9 holes show different pictures, which are also featured on the players' lotto cards. The first player to cover all the pictures is the winner. Contains a plastic frame, ball, insertion board with animal pictures on both sides, 4 lotto boards with animal pictures on both sides and 36 playing chips. Turbino is a spellbinding blowing game. It's easy to blow the propeller into motion but it's not easy to control it to stop at a specific square! Turbino is a challenge and fun for all children, at the same time it develops their breathing control making Turbino very suitable for helping children with speech disorders. The game contains two picture circles with different degrees of difficulty. The strong storage box (22cm x 22cm) contains a plastic base and propeller, picture circule with animal pictures on either side, 2 fabric bags, 10 grey and 10 orange rubber rings.